There are two fundamental worldviews that have currency today. Roland Quizz, Giant-Land, chap xxxii. I use the word Miracle to mean an interference with Nature by supernatural power. Unless there exists, in addition to Nature, something else which we may call the supernatural, there can be no miracles. Some people believe that nothing exists except Nature; I call these people Naturalists. Others think that, besides Nature, there exists something else: I call them Supernaturalists. Our first question, therefore, is whether the Naturalists or the Supernaturalists are right. And here comes our first difficulty. Before the Naturalist and the Supernaturalist can begin to discuss their difference of opinion, they must surely have an agreed definition both of Nature and of Supernature. But unfortunately it is almost impossible to get such a definition. Just because the Naturalist thinks that nothing but Nature exists, the word Nature means to him merely ‘everything’ or ‘the whole show’ or ‘whatever there is’. And if that is what we mean by Nature, then of course nothing else exists. The real question between him and the Supernaturalist has evaded us. Some philosophers have defined Nature as ‘What we perceive with our five senses’. But this also is unsatisfactory; for we do not perceive our own emotions in that way, and yet they are presumably ‘natural’ events. In order to avoid this deadlock and to discover what the Naturalist and the Supernaturalist are really differing about, we must approach our problem in a more roundabout way. I begin by considering the following sentences (1) Are those his natural teeth or a set? (2) The dog in his natural state is covered with fleas. (3) I love to get away from tilled lands and metalled roads and be alone with Nature. (4) Do be natural. Why are you so affected? (5) It may have been wrong to kiss her but it was very natural. A common thread of meaning in all these usages can easily be discovered. The natural teeth are those which grow in the mouth; we do not have to design them, make them, or fit them. The dog’s natural state is the one he will be in if no one takes soap and water and prevents it. The countryside where Nature reigns supreme is the one where soil, weather and vegetation produce their results unhelped and unimpeded by man. Natural behaviour is the behaviour which people would exhibit if they were not at pains to alter it. The natural kiss is the kiss which will be given if moral or prudential considerations do not intervene. In all the examples Nature means what happens ‘of itself’ or ‘of its own accord’: what you do not need to labour for; what you will get if you take no measures to stop it. The Greek word for Nature (Physis) is connected with the Greek verb for ‘to grow’; Latin Natura, with the verb ‘to be born’. The Natural is what springs up, or comes forth, or arrives, or goes on, of its own accord: the given, what is there already: the spontaneous, the unintended, the unsolicited. What the Naturalist believes is that the ultimate Fact, the thing you can’t go behind, is a vast process in space and time which is going on of its own accord. Inside that total system every particular event (such as your sitting reading this book) happens because some other event has happened; in the long run, because the Total Event is happening. Each particular thing (such as this page) is what it is because other things are what they are; and so, eventually, because the whole system is what it is. All the things and events are so completely interlocked that no one of them can claim the slightest independence from ‘the whole show’. None of them exists ‘on its own’ or ‘goes on of its own accord’ except in the sense that it exhibits, at some particular place and time, that general ‘existence on its own’ or ‘behaviour of its own accord’ which belongs to ‘Nature’ (the great total interlocked event) as a whole. Thus no thoroughgoing Naturalist believes in free will: for free will would mean that human beings have the power of independent action, the power of doing something more or other than what was involved by the total series of events. And any such separate power of originating events is what the Naturalist denies. Spontaneity, originality, action ‘on its own’, is a privilege reserved for ‘the whole show’, which he calls Nature. The Supernaturalist agrees with the Naturalist that there must be something which exists in its own right; some basic Fact whose existence it would be nonsensical to try to explain because this Fact is itself the ground or starting-point of all explanations. But he does not identify this Fact with ‘the whole show’. He thinks that things fall into two classes. In the first class we find either things or (more probably) One Thing which is basic and original, which exists on its own. In the second we find things which are merely derivative from that One Thing. The one basic Thing has caused all the other things to be. It exists on its own; they exist because it exists. They will cease to exist if it ever ceases to maintain them in existence; they will be altered if it ever alters them. The difference between the two views might be expressed by saying that Naturalism gives us a democratic, Supernaturalism a monarchical, picture of reality. The Naturalist thinks that the privilege of ‘being on its own’ resides in the total mass of things, just as in a democracy sovereignty resides in the whole mass of the people. The Supernaturalist thinks that this privilege belongs to some things or (more probably) One Thing and not to others–just as, in a real monarchy, the king has sovereignty and the people have not. And just as, in a democracy, all citizens are equal, so for the Naturalist one thing or event is as good as another, in the sense that they are all equally dependent on the total system of things. Indeed each of them is only the way in which the character of that total system exhibits itself at a particular point in space and time. The Supernaturalist, on the other hand, believes that the one original or self-existent thing is on a different level from, and more important than, all other things. At this point a suspicion may occur that Supernaturalism first arose from reading into the universe the structure of monarchical societies. But then of course it may with equal reason be suspected that Naturalism has arisen from reading into it the structure of modern democracies. The two suspicions thus cancel out and give us no help in deciding which theory is more likely to be true. They do indeed remind us that Supernaturalism is the characteristic philosophy of a monarchical age and Naturalism of a democratic, in the sense that Supernaturalism, even if false, would have been believed by the great mass of unthinking people four hundred years ago, just as Naturalism, even if false, will be believed by the great mass of unthinking people today. Everyone will have seen that the One Self-existent Thing–or the small class of self-existent things–in which Supernaturalists believe, is what we call God or the gods. I propose for the rest of this book to treat only that form of Supernaturalism which believes in one God; partly because polytheism is not likely to be a live issue for most of my readers, and partly because those who believed in many gods very seldom, in fact, regarded their gods as creators of the universe and as self-existent. The gods of Greece were not really supernatural in the strict sense which I am giving to the word. They were products of the total system of things and included within it. This introduces an important distinction. The difference between Naturalism and Supernaturalism is not exactly the same as the difference between belief in a God and disbelief. Naturalism, without ceasing to be itself, could admit a certain kind of God. The great interlocking event called Nature might be such as to produce at some stage a great cosmic consciousness, an indwelling ‘God’ arising from the whole process as human mind arises (according to the Naturalists) from human organisms. A Naturalist would not object to that sort of God. The reason is this. Such a God would not stand outside Nature or the total system, would not be existing ‘on his own’. It would still be ‘the whole show’ which was the basic Fact, and such a God would merely be one of the things (even if he were the most interesting) which the basic Fact contained. What Naturalism cannot accept is the idea of a God who stands outside Nature and made it. We are now in a position to state the difference between the Naturalist and the Supernaturalist despite the fact that they do not mean the same by the word Nature. The Naturalist believes that a great process, of ‘becoming’, exists ‘on its own’ in space and time, and that nothing else exists–what we call particular things and events being only the parts into which we analyse the great process or the shapes which that process takes at given moments and given points in space. This single, total reality he calls Nature. The Supernaturalist believes that one Thing exists on its own and has produced the framework of space and time and the procession of systematically connected events which fill them. This framework, and this filling, he calls Nature. It may, or may not, be the only reality which the one Primary Thing has produced. There might be other systems in addition to the one we call Nature. In that sense there might be several ‘Natures’. This conception must be kept quite distinct from what is commonly called ‘plurality of worlds’–i.e. different solar systems or different galaxies, ‘island universes’ existing in widely separated parts of a single space and time. These, however remote, would be parts of the same Nature as our own sun: it and they would be interlocked by being in relations to one another, spatial and temporal relations and casual relations as well. And it is just this reciprocal interlocking within a system which makes it what we call a Nature. Other Natures might not be spatio-temporal at all: or, if any of them were, their space and time would have no spatial or temporal relation to ours. It is just this discontinuity, this failure of interlocking, which would justify us in calling them different Natures. This does not mean that there would be absolutely no relation between them; they would be related by their common derivation from a single Supernatural source. They would, in this respect, be like different novels by a single author; the events in one story have no relation to the events in another except that they are invented by the same author. To find the relation between them you must go right back to the author’s mind: there is no cutting across from anything Mr Pickwick says in Pickwick Papers to anything Mrs Gamp hears in Martin Chuzzlewit. Similarly there would be no normal cutting across from an event in one Nature to an event in any other. By a ‘normal’ relation I mean one which occurs in virtue of the character of the two systems. We have to put in the qualification ‘normal’ because we do not know in advance that God might not bring two Natures into partial contact at some particular point: that is, He might allow selected events in the one to produce results in the other. There would thus be, at certain points, a partial interlocking; but this would not turn the two Natures into one, for the total reciprocity which makes a Nature would still be lacking, and the anomalous interlockings would arise not from what either system was in itself but from the Divine act which was bringing them together. If this occurred each of the two Natures would be ‘supernatural’ in relation to the other: but the fact of their contact would be supernatural in a more absolute sense–not as being beyond this or that Nature but beyond any and every Nature. It would be one kind of miracle. The other kind would be Divine ‘interference’ not by the bringing together of two Natures, but simply. All this is, at present purely speculative. It by no means follows from Supernaturalism that Miracles of any sort do in fact occur. God (the primary thing) may never in fact interfere with the natural system He has created. If He has created more natural systems than one, He may never cause them to impinge on one another. But that is a question for further consideration. If we decide that Nature is not the only thing there is, then we cannot say in advance whether she is safe from miracles or not. There are things outside her: we do not yet know whether they can get in. The gates may be barred, or they may not. But if Naturalism is true, then we do know in advance that miracles are impossible: nothing can come into Nature from the outside because there is nothing outside to come in, Nature being everything. No doubt, events which we in our ignorance should mistake for miracles might occur: but they would in reality be (just like the commonest events) an inevitable result of the character of the whole system. Our first choice, therefore, must be between Naturalism and Supernaturalism. This definition is not that which would be given by many theologians. I am adopting it not because I think it an improvement upon theirs but precisely because, being crude and ‘popular’, it enables me most easily to treat those questions which ‘the common reader’ probably has in mind when he takes up a book on Miracles. Previous PostDominoesNext PostA High Calling. Naturalism is without foundation – in a literal sense. As a counter to this proposition a naturalist can posit that everything is the foundation – but this idea makes no sense. IMO “Naturalism” is a mis-framing of the intended topic. Our first choice must be between there being a foundation or not. 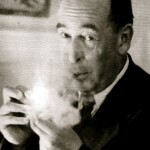 Notice that C.S.Lewis acknowledges this question of foundation when he states “… God (the primary thing)…”. There doesn’t appear to be philosophical terms for this (Foundationalism, Afoundationalism, Metaphysical Foundationalism, Metaphysical Afoundationalism?). Reed, Without a foundation you end up with an infinite regression, and believe it or not that is exactly what some eastern religions purposed. They said the Earth sits on an Elephants back, which stands on a tortoise, which stands on a tortoise, which stands on a tortoise, etc (or some such arrangement as this). Here is one version of it…. That there is *something* is amazing. When we look at the universe and ask about ‘foundations’ we are asking if the universe/ nature is eternal or does it have a beginning… and science says it (the universe and Nature) does have a beginning! Thus Super-naturalism becomes a Rational Belief, and naturalism becomes absurd. Then when you listen to what Einstein said about the Natural Laws declaring a super intelligence, and even Dawkins admitting that living things look like they were designed for a purpose… and add to this our first hand self evident experience of our own conscious awareness… Then the Divine Being *God* becomes the most obvious answer. Ie That Everything, including our own thinking consciousness comes from the Greatest thinking consciousness… the Absolute Being outside Matter…by whom all things consist. The Bible Reveals this True God to us, and explains why he has separated himself from us… The Sinful Nature of Mankind is one of the most solid facts of reality. Anyone with a conscience knows their own sinfulness. 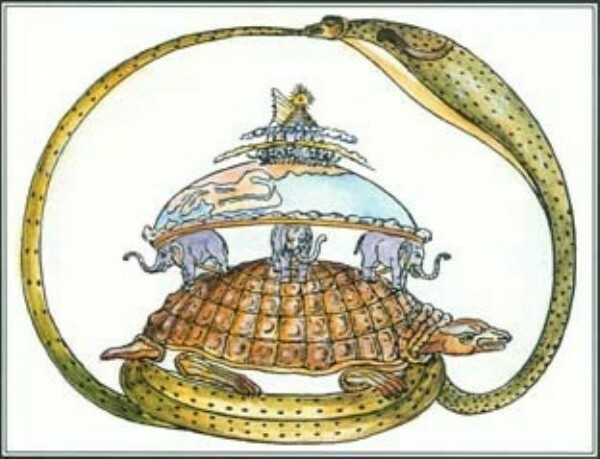 What is interesting about this picture is that it appears to modify the Idea of ‘infinite turtles’ by encasing ‘reality’ in a circular serpent! It The ultimate being in Hinduism is Leviathan! Tim, your “circular serpent” is Ouroboros. Our first choice must be between there being a foundation or not. … a naturalist can posit that everything is the foundation – but this idea makes no sense. Reed, what are you trying to say? That our first choice must be between an idea that makes no sense and one that does? No. I was trying to say that there is either a foundation or no foundation. This is our fundamental choice. In a previous discussion a doctor of philosophy 😉 posited that existence as a whole could be its own foundation – this idea makes no sense. > existence as a whole could be its own foundation – this idea makes no sense. If existence [as a whole] is its own foundation is the following statement true or false? To me it looks as though under that assumption it would be both true and false or perhaps both not true and not false. Reed, That is what I meant by saying that the question is really about the universe as an eternal reality or having a beginning. That Dr of Philosophy must mean that the Universe is eternal… it is its own foundation. Now that it has been realised that the 2nd law of Thermodynamics has proven that the Universe had a beginning… and interpretation of ‘Red shift’ is that the universe is expanding… the Materialists have been forced to abandon their previously held claims that the universe is it’s own foundation… yet because they refuse to admit that *a God* created the universe they attempt to say the universe ‘popped’ into existence 13 billion years ago… out of a quantum field… which is by their definition still a naturalistic realm… ie a dead and nihilistic reality… and they now claim (by blind faith) that this quantum field is the self-existing ultimate reality. All they have done is fashion an atheists God. Do not be fooled into thinking the Hadron Collider vindicates their theory. It certainly does not. All the Collider does is prove that Proton’s etc, are made from smaller particles, and that there exist other particles as yet unknown. When you read all their theories about Quantum fluxes materialising and dematerialising random Cars, and junk you ought to appreciate how batshit crazy atheism is and how Sane the Book of Genesis is by comparison! An atheist will believe any absurdity to avoid admitting the Bible is rational. Yet all along the Bible has proven to be True. It declared the universe, and the world were finite creations. It declared there are greater realities. And it’s biological laws of Genetics have also been vindicated. Adam and Eve are scientific facts. True science is not the enemy of Bible belief but a valuable ally. The Fool hath said in his heart there is no God. These are three separate questions. Can nature be an artifact and there be no metaphysical foundation? 1. Is there a metaphysical foundation? 1. Is there a metaphysical chassis? Was Einstein a Naturalist or a Supernaturalist? Reed, Einstein was a Naturalist. Well that would kill my Einstein argument against Naturalism/Supernaturalism. God has infinitely many other attributes which are not present in our world. It sounds to me like this is a supernatural foundation. This would make Einstein a supernaturalist and not a naturalist. A deterministic God could not have free will and would therefore be natural. This would make Einstein a naturalist and not a supernaturalist. would they be a naturalist or supernaturalist? existence as a whole could be its own foundation – this idea makes no sense. If ‘foundation’ is a gravitational metaphor, then I guess not. I don’t believe in “free will” – the idea makes no sense. I know you don’t believe in free will. The question isn’t about you – it’s about the categorisation. Is this question lacking a vital attribute to determine whether the person is a naturalists or a supernaturalists? Is there an intelligent purposeful foundation? If there is then nature is an artifact. If there isn’t then nature is not an artifact. 2) If there is a foundation what are the foundation’s attributes. Richard. Freewill does not make sense in a materialist reality. It makes perfect sense in a Dualistic one. What amazes me is how often you exercise your own free will every day, yet because you’re own Pet materialist ideology forbids the Idea… you have been rendered incapable of admitting this common fact to yourself! It’s like saying water is not wet… because your ideology forbids it! You cling to your superstition out of shear terror of loosing your mind! Thus in the face of reality, it is your Rationale which makes no sense Richard. According to your theory Richard…. *Libertarianism makes no sense*. Better to use threats of physical force and brainwashing to control/ coerse and condition/program the sheep… These ‘tangible realities’ fit better within a purely naturalistic universe. Hoping to enlighten/ stir/ awaken a conscience… (what the hell is a conscience??? Another theistic myth!) so that people voluntarily choose to live moral lives (what the hell is ‘Voluntary’… what the hell does Moral mean?…. Absolutely nothing in a Materialist reality! These are all theistic ‘fictions’ ‘delusions’ without basis in your Materialist reality…. which makes so much ‘sense’ to you!!! ???? You still think like Dawkins… trapped in the rusty cage.